Abstract. Cuckoo eggs are renowned for their mimicry of different host species, leading to the evolution of host-specific races (or 'gentes') defined by egg colour and pattern. This study aims to test the prediction that another property of parasitic eggs, namely shell strength, might also have experienced divergent selection within cuckoo species. Host races of the common cuckoo Cuculus canorus encountering stronger host rejection have thicker-shelled eggs than those parasitising less discriminating species, as expected if egg strengthening discourages host rejection. Moreover, in the diederik cuckoo Chrysococcyx caprius, eggshell thickness was correlated across cuckoo gentes and host species, as expected if eggshell strength has been involved in coevolutionary interactions. This is the first report of host-specific differences in cuckoo egg properties other than colour and pattern and lends correlational support to the hypothesis that the strong eggshells of brood parasites are an adaptation to reduce host rejection. 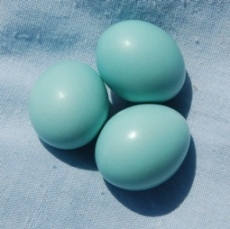 Eggs of 16 weaver species were measured, including the blue eggs of Southern Red Bishops Euplectes orix.